My client Jasmine was frustrated with her lack of weight loss. Jasmine was a working mom with two young kids. She burned the candle from both ends. She always showed up to her workouts exhausted. But she still crushed it. She was slowly getting stronger and losing weight. Her nutrition game was on point as well. She was dutifully tracking all of her food on My Fitness Pal. Initially, she lost weight and started to notice changes. Eventually, however, her progress stopped. After a month of Jasmine not progressing, I began to probe about her sleep. “How many hours a night are you sleeping?” I asked. “4 to 6,” she responded. I instantly knew that in order for Jasmine to continue getting results, she needed to get more sleep and better sleep. Recently, I have experienced sleep deprivation first-hand. Nicole and I came home from the hospital last week with a new baby, Cooper James Klingler. He’s pretty cute, but New babies do not have the slightest concept of mom and dad’s sleep needs. I’ve noticed I’m more hungry on days when I didn’t sleep well or enough the night before. Being really tired also seems to deplete my will power. Being really hungry and having minimal will power is a bad combo, let me tell you. I ate poorly and way too much in the days following Cooper coming home with us. When we miss out on sleep, eating well becomes challenging physically and psychologically. When you are sleep deprived you’ll be less satisfied with the food you eat, want to eat more food, and make poor food choices. A recent study was done on sleep deprivation. One group was allowed to sleep 6 hours per night and the other only 4. All of the subjects meals were tracked and feelings of fullness and satisfaction were noted. The 4 hour sleepers reported feeling less full and satisfied with their meals even though they ate the same food in the same amounts. It appeared from this study the less sleep a person gets, the more likely they will be to make poor food choices. When we control our portions and make good food choices, weight loss becomes much easier. Sleep deprivation makes both of these things challenging. Sleep deprivation can throw off the hormones which controls and regulate hunger. A lack of sleep alters our circadian rhythms. When the circadian rhythm is off, it often leads to increased feelings of hunger and a need for the body to find sugary foods. The parts of the nervous system that give the brain feedback on energy balance by monitoring things such as blood sugar and leptin levels get out of wack. When we lack sleep, the brains communication with our feelings of hunger is disturbed. I won’t go into the details of the change in our hormonal milieu when we forgo sleep. But know there are actually physical changes in our bodies that make it more difficult to lose weight and keep weight off when we forgo sleep. In today’s world of Starbucks on every corner, it seems sleeping less is a badge of honor. But, we desperately need sleep if we are to accomplish our fitness goals. Here are a few of my best tips for getting good sleep. Last year, I kept a sleep journal for two weeks. I would write everything I did in the hour before bed, how I slept during the night, and how I felt upon waking. It was enlightening. The days I had something ambiguous going on the next day, I slept poorly. I also noticed that what I did in the hour leading up to bedtime was important. If I spent my last waking hour working, answering emails or looking at a screen, I slept poorly. If I read a book for pleasure or listened to Harry Potter on audiobook, I slept quite well. Once you get a feel for how your pre-bed ritual affects your sleep quality, you can make changes. You can also play with you sleep environment to get better sleep. For me, starting a bed time ritual of listening to an audiobook with Nicole has made a huge difference in our sleep quality. There is something magical about listening to or reading fiction that allows our brain to disconnect with the craziness of the day we’ve just had. Find something that helps you shut off and prepares your body for sleep. But some sleep issues can be controlled. Don’t watch TV late at night. The bright lights from the TV screen keep our brains awake and prevent us from drifting into good, quality sleep. Starting a business, studying for my physical therapy boards, and having a baby have made following a sleep ritual almost impossible. Thankfully, I still sleep really well each night. If you’re struggling to sleep and you think it’s important, try following the 10-3-2-1-0 rule created by Craig Ballentyne. Each of these variables could be the reason you’re struggling to get quality sleep. No, it won’t be easy to implement the 10-3-2-1-0. Each is difficult and inconvenient, but so is being tired all day. Give the formula a try if you’re ready to make a big change in your sleep. Bedtime should be at least 8 hours before you have to wake up. This means no late night social events and no last minute to-dos. In the past, I wouldn’t go to bed until the to-do list was done. Sometimes this was 10pm and sometimes 1am. This became a problem when I started getting up at 4am. The alarm sounded like impending doom. My days dragged on and I always needed a nap (or coffee) in the afternoon. My productivity suffered and I wasn’t pleasant to be around. Matt and I now (usually) go to be 8 hours before we wake up. It doesn’t always happen because we are social butterflies. But we’ve made huge strides in the right direction. Start small. If you usually go to bed at midnight, don’t try going to sleep at 8. Your body isn’t used to the time change and you’ll just lay there. Try going to sleep half an hour before you normally do. The temperature in your room when you go to bed should be cool (like the other side of the pillow). It is always easier to add another blanket on top of you, but not so easy to take layers off. The summers in SoCal are brutal. The first summer we lived here, our sleep was mediocre. We even set up an intricate system of fans to blow air from our living room swamp cooler to our bedroom. It didn’t really work that well. Eventually you can no longer take any more layers off. This past summer we took drastic action and invested in a window AC. #LifeChanging. We now sleep in a cold bedroom with a warm blanket on top. We instantly noticed an increase in our sleep quality. Any type of artificial light will alter your sleep. Someone decided it was a good idea to put a floodlight right outside our bedroom window. So we decided to stick it to the man and put up dark brown curtains. Consider investing in dark curtains and put a towel or clothing over any flashing or little lights in your room than may disturb your sleep. Research says even a small light in the room can alter our sleep. When I got my first smart-phone, I got rid of my alarm-clock and switched over to the phone alarm. This is a big sleep mistake. Even if you put the screen face-down, just knowing people may call or text you in the middle of the night is a huge distraction. There is also temptation to look at your phone to check the time. I know some people put their phone on do-not-disturb, but this doesn’t solve the blue light problem. We ordered an alarm clock that plugs into the wall but also has a battery so if the power goes out, it still works. 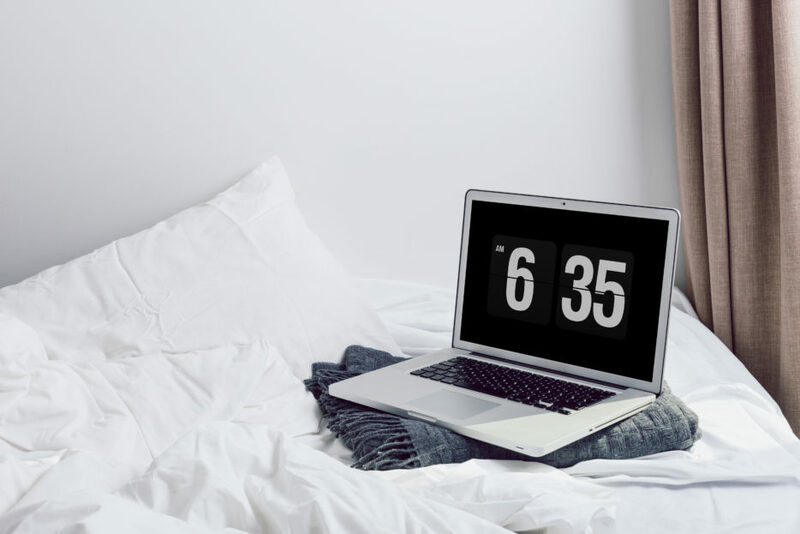 A good alarm clock is a cheap and easy fix to improve sleep hygiene. There are numerous studies linking alcohol consumption to poor sleep. It may help you fall asleep initially, but your quality of sleep is worse. Once the alcohol sugars are metabolized, we become more alert and stimulated. This can prevent REM sleep (the most important type). Stop alcohol consumption 3 hours before bed to insure you get good quality sleep. Jasmine wanted a way to sleep very little and still achieve her fitness goals. Eventually, her body said no. For Jasmine, lifting heavy weights and eat well was a huge step in the right direction. Sleep, however, was the missing link. Jasmine decided to trust me and got serious about her sleep. She started sleeping a minimum of 7 hours per night. She also adopted a sleep ritual that prepped her brain and body for bed. Within a few weeks, she started losing weight again. She even noticed a bump in her productivity at work. She was ecstatic! Sleep is fundamental for long-term results. Sure, like Jasmine, you will see results initially in your fitness without good sleep. But, you’re seriously short-changing yourself if you neglect a good night’s rest. Sleep isn’t something we can “hack” and get around. You simply need to sleep 7 or more hours per night if you want to accomplish your fitness goals.